While I was away on vacation in July I had the opportunity to have an amazing guest post from Jamie from Mom’s Test Kitchen. Jamie and I created a great friendship because she is absolutely amazing and she became a sponsor for the month of August! We actually share someone who is very near and dear to our heart because she did the design work for both of our sites. That would of course be the very talented and ever so patient Colleen from Paisley Boulevard. Love her! Jamie is here today to share a fabulous dessert recipe and to offer a giveaway to Target! I’m so happy to be here again guest posting for Jenny!! Since I shared a delicious dinner with you last time I was here, I’m going to go ahead and round out that meal for y’all with a tasty but oh so simple dessert!! Not only is it simple, it is also versatile. You can substitute any of your favorite pie filling flavors!! 1. Preheat the oven to 350 degrees. Coat 2 loaf pans with cooking spray. 2. In a large bowl, beat together the cake mix, butter and egg until crumbly. 3. Pour your apples into your pans – 1 can per pan. 4. 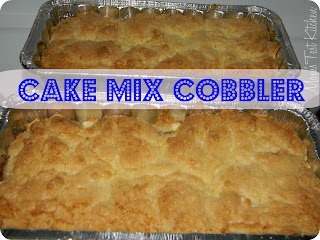 Cover the apples with the cake mix – you just have to crumble it on top and cover the apples as best you can. 5. Bake for 30 minutes or until the topping has started to turn golden brown and has hardened. So thank y’all again for letting me share another recipe recipe with you! And remember, if you’d like to see more of my recipes, you can find me at Mom’s Test Kitchen, follow me on Twitter and Pinterest or like me on Facebook. That recipe looks great! Can’t wait to try it! I hope you like it Sara! If you do try it, I would love to hear how it turned out!! Geez Target has too many choices. I would use it towards Christmas gifts.